The Yes! Organic Market in the U Street Corridor has historically had a poor selection of kale chips, but has recently been offering a better selection. In the past, I've seen some really nasty chips come through that store, but luckily the bad ones usually come off the shelves pretty quickly. 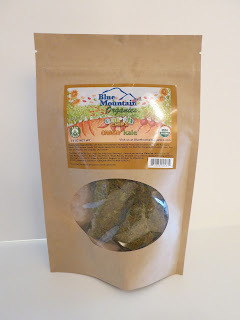 On this particular occasion, I noticed that a brand I had tried before, Blue Mountain Organics, had changed their look and their kale chips. So, I thought I'd give them another try. Their kale chips have always been unique in that they are loaded with seeds. The ingredients include cashews, nutritional yeast, sesame seeds, sunflower seeds, pumpkin seeds, hemp seeds, chia seeds, red bell peppers, lemon juice, sea salt, paprika, tumeric, and chipotle. I was surprised when I opened the bag and realized that not only did they look different, they weren't even really kale chips anymore. They formed the kale into bark and there were just a few pieces of bark in the $8 bag. The flavor was "Cheezy Kale," but it didn't really taste cheesy. The bark was thick and had a taste reminiscent of moss. It was harsh with a weird aftertaste. I'm not sure why they decided to go from chips to bark, but I don't like them. I hope they figure out their recipe soon because their first recipe was much better.